Enjoy the unmistakable summer scent of Sweet Pea. The masses of brightly coloured blooms will easily climb a trellis. Ideal for cutting wonderful posies for your home! Supplied as 12 plug plants. 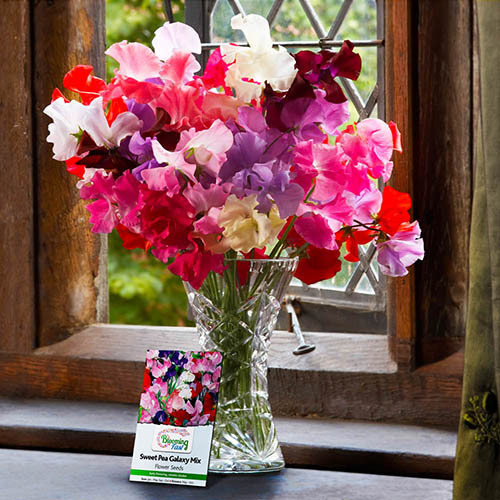 These Super Fragrant Sweet Pea plants will provide bunch after bunch of long-lasting scented flowers to cut, throughout June and July, making lovely posies in a vase or gifts to friends and family. Supplied as:12 mixed coloured Jumbo Plug plants in net pots ready to plant. Each plug multi-sown with approx. 4 plants (therefore a total of approx. 48 plants). Height/Spread: 1.2m (4ft)/30cm (12). As the plants mature, you'll notice that the stems get shorter. To keep longer stems on the blooms, feed, water and deadhead plants regularly to provide extra energy. When the roots have filled the net pot, they're ready to be planted out. Sweet peas love fertile soil, so before planting, dig in pleanty of organic material around the base of a teepee or frame - manure is best as it helps retain water on a freely drained soil and gently feeds these hungry plants. Each net pot is multi sown to contain a minimum of 4 plants. Plant directly into the ground with the pot (the roots will grow through), or tease the plants out of the pot and divide them, planting each separately. Sweet peas require a support sytem to climb up such as wire, canes or netting. Once three or four pairs of leaves have developed the plants should be pinched by removing an inch or so of the growin gtips to encourage more shoots to develop. As the young sweet pea plants begin to grow, tie them into their support. Water regularly and feed once a fortnight with a high potash feed. Pick blooms regularly and don't allow seed pods to form as these will stop the plants producing flowers.